Curry leaves also known as Karibevu in Kannada and Kadipatta in Hindi has lots and lots of health benefits. We, South Indians can't imagine cooking any curry without this fresh curry leaves. It is rich in iron, folic acids, Vitamin A, B ,C, E , amino acids, calcium and lots of other minerals too. It helps in keeping a check on diabetes, cholesterol levels and even helps in delaying premature hair greying. 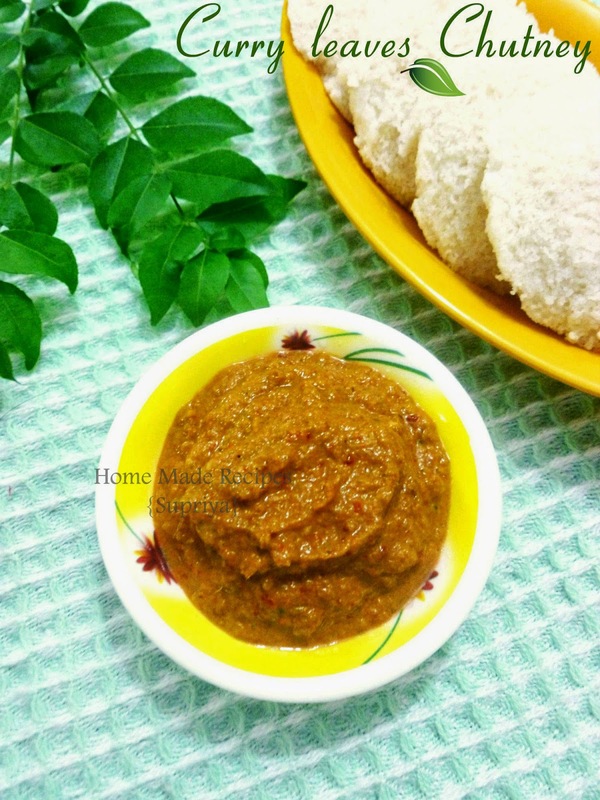 Curry leaves chutney goes very well with hot idli's, dosa's or even with paddu's. So lets head towards the healthy chutney recipe asap. 1. Heat 2 tsp oil in a wok. Add urad dal and fry till light brown. Remove it and put it in a mixer jar. 2. In the same wok, add red chillies and fry it for a minute. Switch off the flame and add all the rest of the ingredients to it and mix. 3. When cooled completely, add this to the mixer jar and blend it to a smooth paste. 4. Healthy curry leaves chutney is ready to be served. You can also do the tempering to chutney with some mustard seeds at the end. We like it this way, so I skipped it. You can also use green chillies instead of red chillies. Be careful will frying green chillies. Its always better to chop them or slit them before frying.